This building is almost across the road from yesterday's building. I love that little balcony with the columns on the top floor. 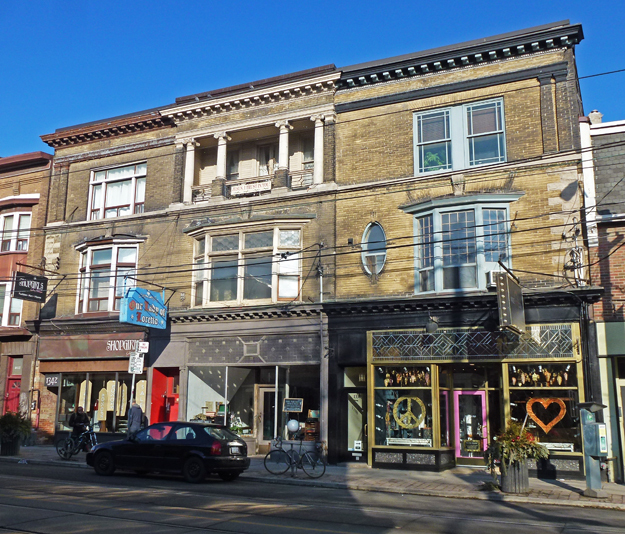 The building was constructed on Queen St W in 1898 and now houses three stores on the main floor - a jewellery store with the peace symbol & heart, a knitting store, and a woman's clothing store. And that is my venerable Honda parked out front! I would enjoy shopping there! I love that little balcony, too, but I love everything about these buildings...the architecture is so exotic; you just don't see this kind of thing anymore. At first I thought these stores sold exotic erotica, but that's just my overactive imagination. Don't see the peace symbol as much today as we used to, and that's too bad. We need more signs like the peace and heart images. Looks like a delightful place to visit. What a great looking building. The balcony and columns are wonderful as is that oval window. Those look like interesting shops too. I have a venerable Honda too! We need to pay more attention to those peace and heart signs! Lovely area offering many delights. The shop looks like something from the 1960s. Interesting photo. I didn't know Honda made bikes! Neat buildings, are they apartments above the shops then? A very characterful building & sporty black Honda! Regarding your comment, I don't know what became of RR's blog. I know it's no longer accessible. He is, however, on Twitter. That balcony really IS wonderful, as is the whole building. And the signs. And the Honda isn’t bad either )). The building has lots of character and that balcony is very cool looking. It would serve as a great people watching porch. I love the windows on the second floor. That is definitely a stylish balcony! Great building in that neo neo style. Um abraço e desejo-lhe uma Boa e Santa Páscoa. That little balcony is really neat ! Hello, what a neat building. I like the balcony. The window display with the heart and peace sign are cute. Happy Thursday, enjoy your day! My son and a girlfriend lived at Queen and Jarvis at one point. I grew up on Walker Ave.
That is a lovely balcony, isn't it?! So much to see and enjoy here Pat, looks like there's lots going on in this architecturally appealing building. Love the character of the whole building and the columns are very cool. What a fine place indeed, and all the shops it must be quite an interesting place, and the folks with the balcony are lucky too! That is quite a charmer. The third floor balcony, not the little Honda. Though I am sure it is also charming.